Logan Collins thought his life would be normal once he moved back from Meridia Falls. But it turns out nothing is normal in this mysterious, isolated town. The school injects its students with mysterious vaccines, multiple people have gone missing, time freezes, and thoughts, feelings, and whole lives can be transmitted through touch. But as Logan learns more about himself, he’ll have to face whether its this town that is insane – or if it’s simply him that is. 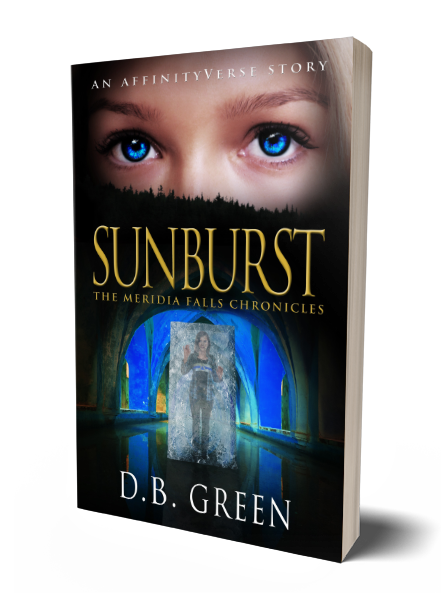 Sunburst is Book 2 in The Meridia Falls Chronicles – a fantasy thriller series which will give you that thrill ride of fast paced, event TV. Twists and turns that will not only keep you on the edge of your seat, but have you clinging to it for dear life. After his father is put on death row for the murder of his sister, Logan Collins is forced to accept that his psychiatrists were right – that the white door he saw was only in his mind, an illusion to cope with the truth. But when he returns to his mysterious hometown of Merida Falls to start over, he comes face to face with a girl who has haunted his dreams – and may reveal the magical truth about his past.